Shipping: All benches are drop shipped from our supplier to you direct. This saves shipping costs and gets your bench to you fast. 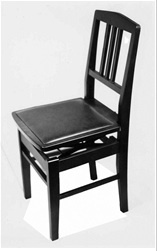 Elegant, full-back practice/concert chair; adjusts from 16 1/2" to 21" with 14 stepped adjustments which can be locked in place. Overall height 35 1/2". Duet SCHOOL Bench with 3 braces between legs. This hardware is used to make repairs and customize piano benches. Be sure to get the correct order number from the prahichs above for the exact stool you want. For round top stools, be sure to fill in all data so I can tell what to send you.